Engage your users, manage content, monetize services and continuously monitor quality and performance: Our modular platform can help you to achieve your goals by driving success in every aspect of your video business. Provide a rich set of video features and interfaces and rapidly configure and deploy services to market with a micro service, web-scale platform. Deliver data-driven, unique and cost-effective experiences that can be adapted at speed using our multi-device UI Builder. The UI Builder is an AVS module that enables visual and dynamic configuration of user experience elements on any application (web, iOS, Android, set-top box, gaming console, etc), and manages diversely complex business logic. Define an intuitive user interface without the need for development or technical knowledge of applications. The UI Builder enables creation of menu structure; page composition with definition of content trays and content collections, whereby content trays can be bundled by type, e.g. “Adrenaline Bundle”; and content orchestration. Your editorial team has full control over the UX, with flexible management of menu items and page composition. The AVS User Experience Personalization tool enables you to modify your user interface (UI) in seconds, avoiding certification steps while maintaining high performance. AVS UIs can dynamically optimize by device, user profile, time and location. Drive user engagement and differentiate your content recommendations with effective sorting and labelling options. This easy-to-use tool is designed to move in time with the dynamic expectations of your customer base. Deploy rapid market launch with the AVS reference UIs and complete set of apps. AVS provides reference UIs for the most popular technologies on the market, including iOS, Android, and web. Enabling rapid time to market, AVS reference UIs can be enriched with more than 300 features that are available off the shelf, including live and on-demand video, content discovery and recommendations, reminders, and network PVR (nPVR). Pre-integrated apps are fully configurable server-side and are driven by data. A UI Builder enables you to tailor the UI and customer experience to align with user segments, devices and geo-locations. AVS monitors the complete user journey by collecting and integrating data on events to continually improve technical performance and the customer experience. Go fully bespoke and deploy a powerful brand experience with complete solution customization. We can provide you with open access to a set of micro-granular, fully documented back end APIs that allow you to integrate any device, platform or third party component, giving you the ability to extend AVS with the products and functionalities you require. AVS Customer Management has all the tools you need to manage and support your customer base with an easy-to-use, web-based console. Manage your customers and their devices, subscriptions, and purchases. Organize and manage user profiles and data. Create and manage customer hierarchies leveraging master and sub accounts, or use blacklist and whitelist functions to control customer access. Take advantage of our clustering tool to create dedicated messaging, navigation and discount options and tailor the customer experience. Our market requires speed and agility, and AVS Customer Management gives you the tools you need to ensure an optimized service. AVS Commerce Management provides maximum flexibility to meet the needs of different commercial models, including ad-funded, subscription-based and hybrid, helping you to effectively manage your commercial catalog. Gain flexibility on content packaging, leveraging transaction-, subscription- and bundle-based options, and assign discounts and promotions to customer profiles. AVS enables multi-currency and multi-geography options, supporting overseas business expansion. AVS Commerce Management provides a simple way to manage your commercial offerings and helps to increase the flexibility of your business models. AVS Device Management is a cross-IPTV and -OTT feature that allows you to control access to your service and content. Access policy management, blacklists and whitelists, concurrent streaming rules, and device inventories are a few of the capabilities offered through our dedicated service console. Smoothly migrate your set-top boxes from one software version to the next, and allow your customers to use a self-care area to register or unregister their devices. AVS Device Management helps you to move quickly and with agility to ensure a satisfying and consistent experience for your customers, whilst simultaneously maintaining compliance with content owner policies. The AVS Payment Gateway provides maximum flexibility to support a range of different business models. Receive payments quickly and easily through integration with a commercial payment gateway service. Collect and deliver transactions to external billing systems, and enable offline billing and invoicing as well as online content purchasing. Power real time payments, including in-app purchases for iOS and Android, and enable regular PayPal or credit card payments. The AVS Payment Gateway helps you to reduce time to market and simplifies integration with your existing or preferred billing system. Prepare, organize and manage the content catalog seamlessly with a digital asset and metadata management system. The AVS Content Management System (CMS) enables you to rapidly manage and deliver linear, non-linear and virtual linear catalogs to your users on any device. Integrate AVS CMS into your existing infrastructure and deploy your CMS straight away with this out-of-the-box solution. Enable different content packaging options to suit your user needs. Manage and monitor your complete content lifecycle using our powerful, easy-to-use tool, with widgets and dashboards and an extensible data model for enhanced organization. AVS CMS is a proven solution that is currently managing hundreds of thousands of assets for our clients, both on promises and in the cloud. AVS Cloud Transcoding is a powerful and elastic cloud-based solution that enables you to transcode your content in multiple formats, supporting a wide range of DRM options. Scale encoder quantities up or down according to demand, schedules and content queues, and help reduce your overall TCO. AVS Transcoding is pre-integrated with the AVS CMS and supports extensive input/output content formats, in line with industry standards. AVS Cloud Transcoding enables you to provide the high video quality the market demands. AVS support a range of Digital Rights Management (DRM) solutions for maximum content protection, ensuring secure players for all enabled device types. AVS is compatible with most market-leading DRM players and provides the logic to manage content licenses across devices and technologies with a consistent customer experience. Unleash your live and on-demand content catalogs with secure and encrypted content consumption certified by all major film production companies. AVS Network Personal Video Recording (nPVR) provides a reliable and cost-effective solution that allows your users to record their favorite programs. Let your users record single programs or complete TV series, with auto-delete options for storage optimization. AVS supports private copy and shared copy mechanisms, without compromising content delivery network optimization. nPVR can help you to deliver a convergent playback experience across multiple devices. AVS is integrated with state-of-the-art head end providers for both IPTV and OTT technologies, and provides adaptive or constant bitrate streaming for multicast and unicast networks. Enable a live and on-demand video head end, including transcoding, encoding, protection and streaming farms, with Edge servers for optimized quality. The AVS IPTV and OTTV Head End solution is optimized with fast channel change and packet retransmission technologies for smooth content playback. Our end-to-end solution delivers high quality across the board, from signal acquisition to video processing and content distribution. Maximize business performance with a data insight platform that can be leveraged across the digital video business. AVS Content Discovery provides a set of search and recommendation tools that help increase user engagement and content consumption by enriching and personalizing the video experience. Enable basic and complex searches and deploy content recommendations for all content types, including video on-demand and linear. Specific recommendation types include content-to-content, content-to-user, user-to-user, content popularity, business rules and filtering, and cold-start. Content discovery and recommendations are key to simplifying and enriching the user experience for your customers as they navigate extensive digital content catalogs. Digital Advertising provides targeting and segmentation to enhance the monetization of your advertising space by delivering specific content to users at set times. AVS supports a large set of VAST-compliant digital advertising interactive formats out-of-the-box at SDK level. Deliver your advertising with a flexible campaign management model and choose from a wide set of pre defined targeting options to maximize efficacy. AVS Digital Advertising is changing the way advertising is enabled in the video industry. Accenture Video Analytics (AVA) helps video businesses to leverage consumer insights to mazimize their marketing agility and relevancy, increasing the value of their marketing and promotional spend. AVA is based on a foundation layer that collects and correlates data from multiple sources, including both digital and traditional platforms. Using AVA, you can make strategic business decisions based on predictive analytics, and set out a clear plan to improve the future results of key business drivers with actionable analytics. AVA is available as a software or a managed service, with different coverage levels to suit your needs. Unleash dozens of HTML applications and widgets to complement your IPTV user experience with features such as weather forecasts, social networks, news and much more. The AVS set-top box is fully integrated with metrological technology to enable vertical experiences on top of video services. The app catalog can be specialized by user and tailored to align with the content that they have been watching. Measure and manage end-to-end service continuity and the user experience with a centralized platform monitoring solution. AVS leverages artificial intelligence and predictive modelling to assess service health and monitor service status, comparing API performance trends with historical data to anticipate issues before major incidents happen. Video operations require a highly automated approach to ensure “99-multi-9 digit” service continuity SLAs. Mature video services normally generate highly predictable traffic, and the AVS automation process drastically reduces manual activities and troubleshooting, maximizing early detection of service and application issues to avoid service disruptions and outages. We live in a world that is highly influenced by social networks. Video is no exception, and social networks are an effective gauge for the Quality of Experience your customer base perceive. The AVS Command Center for next generation video operations combines traditional operations, including infrastructure and service monitoring, with social sentimental analysis, enabling qualitative end user views that go beyond raw technology and performance parameters. The AVS Command Center changes the perspective of video operations, assessing Quality of Experience through the eyes and means of end users. AVS monitors the complete end user journey throughout the APIs and infrastructure that underpin every single use case. AVS assesses the severity of issues based on the impact on the customer experience and the number of people affected. The AVS operations team can drill down on both infrastructure and service availability to troubleshoot and restore services experiencing issues. Automatic recovery procedures are also available for less critical problems. hyper-personalized experiences with compelling and intuitive graphical interfaces. Enable an engaging, multi device user experience through compelling reference user interfaces. AVS Reference User Interfaces (UI) are available for popular technologies including iOS, Android, HTML5 and Roku. Speed to market with our pre-certified applications and deploy hundreds of end user features, including live video, video on-demand, video recording and downloads. Deliver innovative, content-centric designs powered by leading discovery technologies. AVS Reference UIs support Digital Rights Management, and are fully integrated with AVS Analytics to provide real time monitoring of Quality of Experience. Data is the new currency in digital video. A fully data-driven video platform provides clear, real time views on audience behavior and operations, helping you to make confident business decisions for back-end processes, marketing, and content monetization strategies. The combination of Accenture Video Solution and Accenture Video Analytics as a pre-integrated module is ready to make your video business data-driven. Extending user engagement time and building revenues through optimized, bespoke user experiences. Accenture Video Solution and Accenture Video Analytics combine forces to provide a robust and continuous test and learn approach for your video business. Transforming data from output to input, for a constantly evolving and enhanced user journey, content performance, and user communication. 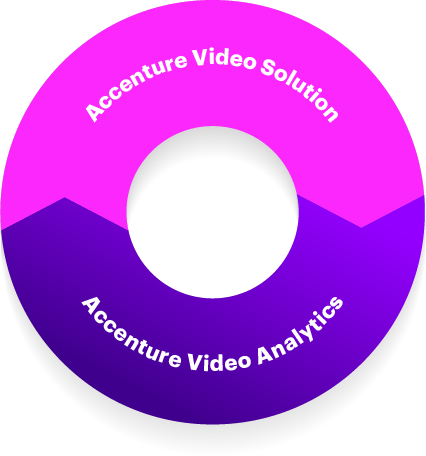 The Accenture Video Analytics module collects data from both video platform components (eg. devices, content commerce, content delivery network) and external data sources such as advertising and CRM systems. This information is compiled in a unique data lake, providing granular insights into every aspect of your video solution—from customer behavior to backend systems, across the full range of business functions—and enabling machine—learning algorithms that segment audiences and inform key business functions. With our data-driven solution, you gain access to a library of analytics models, basic or advanced analytics options, and the choice between a license- or value-based model.